For the third time, leaders of the Church of South India (CSI) got a stay in the court against investigations by the Government in its probe into corrupt practices in the Church. We were unhappy to learn that the CSI hierarchy has managed to obtain a 'stay' from the court to temporarily stop the investigation by the Serious Fraud Investigation Office (SFIO). Church leaders do not want to face any enquiry and stand that puts them in a position of having to reply to any investigation on matters of the illegal sale and mortgage of properties and the massive financial irregularities that go along with it. The venerable institution of leadership, the principles of just governance and the organisational culture built on transparency and accountability are under systematic attack and destruction. The situation cannot be easily remedied and put back together. Members of the CSI are now being pushed into the situation of re-reading Scripture to equip themselves to rediscover the church and redeem it from corruption and fraud. The Ethics and Anti-Corruption Commission (EACC), is certainly aware of this. The churches have to operate at a level where they identify the corrupt persons and bring them to justice even if it means imprisonment. The EACC is already doing a wonderful job in law enforcement against the culprits. "The Commission has continued to employ a three-pronged strategy of law enforcement, corruption prevention and public education in the fight against corruption." Anti-corruption aspirations are not mere Christian sentimentalism; they have strong biblical roots as maintained by the EACC. Anti-corruption is an important subject for those who love the church and God's Word. Anti-corruption is reflected in the very character of God. There is a call for the radical reform of our moral behaviour. The Indian courts also teach society about corruption that destroys the fabric of society by extinguishing the values of morality and right-living. I was skimming through the Judgement document from the Supreme Court of India on the accumulation of wealth through unfair means over the known sources of income case involving the former Chief Minister of Tamilnadu, South India and her close friend. It was an eye-opening experience for me reading SC's views, criticisms and observations on corruption in society and on the punishment meted to corrupt public servants. The Judgement document contains an extensive survey on Indian Laws/Acts that were enacted and are currently in force to combat corruption in public places committed by public officials, particularly those who operate while occupying higher levels of power and authority. The term 'public servant' is expanded by the SC to include CEOs, Directors and Employees of the Company functioning under the Indian Companies Act 2013 and this is squarely applicable to the Chairman and the directors of the CSITA, who are mostly bishops and lay leaders. The Judges said, 'Any person who is an office-bearer or an employee of an educational, scientific, social, cultural or other institution, in whatever manner established' need to be under the scrutiny of the Corruption Prevention Act. Let us apply the statements below to church authorities and administrators, both the lay and the ordained, with a view 'to keep a church administrator or minister free from Corruption and to ensure purity in Church life'. 1)	A criminal misconduct by a public servant is spelled out thus: "if he or any person on his behalf is in possession or has, at any time during the period of his office, been in possession, for which the public servant cannot satisfactorily account, of pecuniary resources or property disproportionate to his known sources of income." 2)	"The scheme of the Act 1988, thus ensure a stricter legislation to combat and eradicate corruption in public life and takes within its sweep, not only the public servants but also those who abet and conspire with them in the commission of offences, enumerated therein." 3)	"Corruption in a civilized society is a disease like cancer, which if not detected in time is sure to afflict the polity of the country leading to disastrous consequences. It was ruled that corruption is like a plague which is not only contagious but if not controlled spreads like fire in a jungle. It was proclaimed that corruption is opposed to democracy and social order, being not only anti people but aimed and targeted against them." 4)	"It can be stated without any fear of contradiction that corruption is not to be judged by decree, for corruption mothers disorder, destroys societal will to progress, accelerates undeserved ambitions, kills the conscience, jettisons the glory of the institutions,...corrodes the sense of civility and mars the marrows of governance. It is worth noting that immoral acquisition of wealth destroys the energy of the people believing in honesty, and history records with agony how they have suffered." 5)	"In a charge of corruption expressed its concern against rampant venality by public servant (the court) observed that the malady is corroding like cancerous lymph nodes, the vital veins of the body politics, social fabric of efficiency in public service and demoralizing the honest officers. The need for public servants to devote their sincere attention to the duties of the office was emphasized." 6)	"It was observed that the corruption is an enemy of the nation and to track down the corrupt public servant and to punish them is the necessary mandate of the 1988 Act and as such the purposes of law being either to eliminate public mischief or achieve public good, the classification militates against the same and in a way advances public mischief and protects the crime doer." 7)	"...as corruption is not to be justified in degree. A serious concern was expressed noticing the permeating presence of the malady in the contemporary existence, so much so, that immoral acquisition of wealth visibly has the potential to destroy the morale of the people believing in honesty, destroying societal will to progress, aside corroding the sense of civility and enervating the marrows of governance." 8)	"...the ambit of Section 165 was wider than that of Sections 161,162 and163 Indian Penal Codes (IPC) and was intended to cover cases of corruption. It was elaborated that the difference between the acceptance of bribe made punishable under Section 161 and 165 IPC was that under the former section, the present is taken as a motive or reward for abuse of office but under the latter, the question of motive or reward is wholly immaterial and the acceptance of a valuable thing without consideration or with inadequate consideration from a person who has or is likely to have any business to be transacted, is forbidden because though not taken as a motive or reward for showing any official favour, it is likely to influence the public servant to show official favour to a person giving such valuable thing." The FINAL illuminating comments come from the Honourable Justice J. Amitava Roy. He writes, "A few disquieting thoughts that have lingered and languished in distressed silence in mentation demand expression at the parting with a pulpit touch." i)	"A growing impression in contemporary existence seems to acknowledge, the all pervading pestilent presence of corruption almost in every walk of life, as if to rest reconciled to the octopod stranglehold of this malaise with helpless awe....Emboldened by the lucrative yields of such malignant materialism, the perpetrators of this malady have tightened their noose on the societal psyche." ii)	"Corruption is a vice of insatiable avarice for self-aggrandizement by the unscrupulous, taking unfair advantage of their power and authority and those in public office also, in breach of the institutional norms, mostly backed by minatory loyalists. Both the corrupt and the corrupter are indictable and answerable to the society and the country as a whole." iii)	"This pernicious menace stemming from moral debasement of the culpables, apart from destroying the sinews of the nation's structural and moral set-up, forges an unfair advantage of the dishonest over the principled,....It encourages defiance of the rule of law and the propensities for easy materialistic harvests, whereby the society's soul stands defiled, devalued and denigrated." iv)	"Such is the militant dominance of this sprawling evil, that majority of the sensible, rational and discreet constituents of the society imbued with moral values and groomed with disciplinal ethos find themselves in minority, besides estranged and resigned by practical compulsions and are left dejected and disillusioned. A collective, committed and courageous turnaround is thus the present day imperative to free the civil order from the suffocative throttle of this deadly affliction. Every citizen has to be a partner in this sacrosanct mission, if we aspire for a stable, just and ideal social order as envisioned by our forefathers and fondly cherished by the numerous self-effacing crusaders...pledging their countless sacrifices and selfless commitments for such cause." The Rev. Dr. Muthuraj, is a former member of St. John's College, Durham and a graduate of the University of Durham, UK. Through his publications, he has been established as a CSI historian who currently writes on the relationship between the united churches and the Anglican Communion. 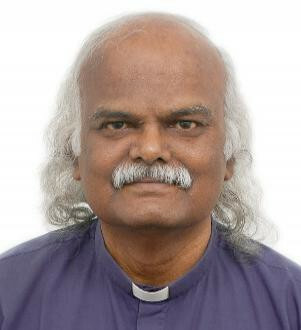 He has been one of the strongest voices in the global theological communion appealing for a renewal of Episcopacy to bring an end to the corruption in the Church of South India.